For the latest version (4.09) of STG FolderPrint Plus I am trying a new watermarking system. The old system (in the left, below) used a large graphic with Unregistered when printing. This didn't look good and has problem in some printers. 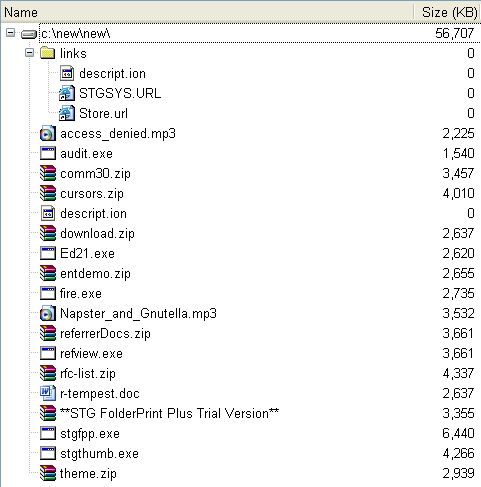 The new system changes the name of every 15th file in the file list to **STG FolderPrint Plus Trial Version**. Opening the file and other operations still work, and if you save, it will load with the right name, too. They are currently going through A/B Testing (so any given install may have either version). For anyone who is curious about it – the version on the top (text replacement only) got 50% more sales over an year. Given that the older version had problems with some printers, the top version is the only watermark on the program now (version 4.10).